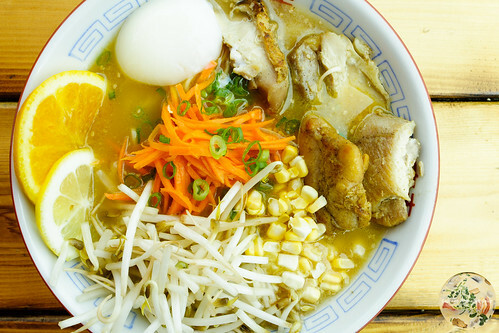 As of late, ramen has been the new fad. Those who may have had more than enough ramen from the little block packages during your college days may give a side eye. But proper ramen is all the rage. One good thing about it is there are some restaurants that do the noodle dishes justice. 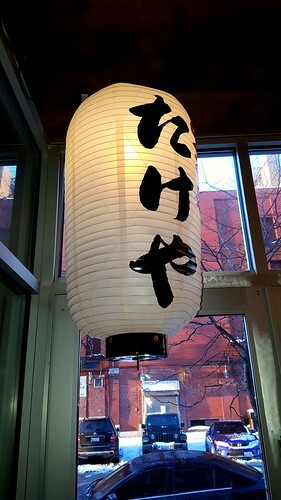 Ramen Takeya at 819 W. Fulton Market in Chicago’s West Loop gets it right. 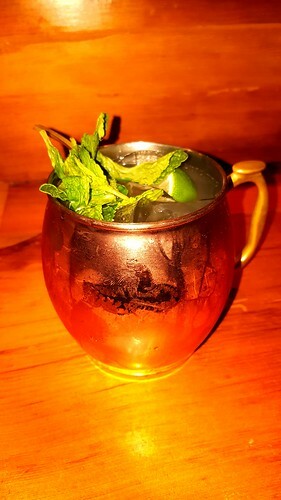 Having my usual hankering and a bit of curiosity about Ramen Takeya, I made my way over to the restaurant after work and started with a Moscow mule to take the edge off. Not as strong as one I had in Denver when a classmate hipped me to the cocktail, it was still good going down. Since I didn’t want to stuff myself, I noted two small dishes and a ramen dish that I figured would be a good introduction to the restaurant. So, I settled on three menu items, reserving dessert for something else later. The first landing was a bowl of ebi chili. The shrimp was fresh, tossed in a sweet and sour chili sauce, which was a winner. The dish was a salad with lettuce that had been accented with salt and pepper and what seemed like perhaps some lemon juice. It was not competitive with the spicy shrimp, as it was a better complement to the shrimp than I have had at a few other restaurants that prepared the same salad. For those who like light starters and have a taste for shrimp, I recommend this highly. The second landing was barbecue eel. Served in a cup over rice, this was a winner. The sauce was neither overpowering nor excessively too much over the rice. 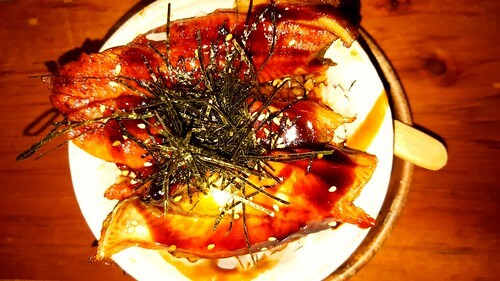 Being a fan of unagi, it was great having eel that was meaty without having a fatty texture on the palate. The final landing was a bowl of spicy chicken paitan. With mushrooms, bamboo shoots, a sunny side egg, onions, scallions, and chili sauce spice, there was a balance to the ramen but still with an allowance for the seasoned chicken to shine. Instead of a huge bowl full of ingredients, you get a nice sized bowl full of flavour. 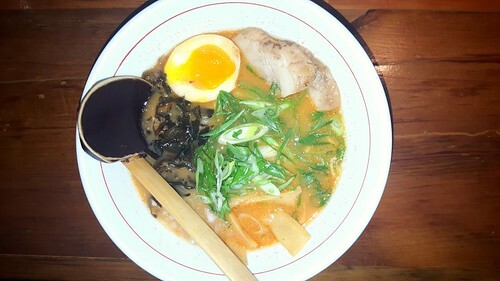 Like many restaurants in Chicago’s West Loop, Ramen Takeya fills up quickly with the after work crowd. There are a few tables in the immediate area where you enter and tables along a short corridor that faces the open kitchen. 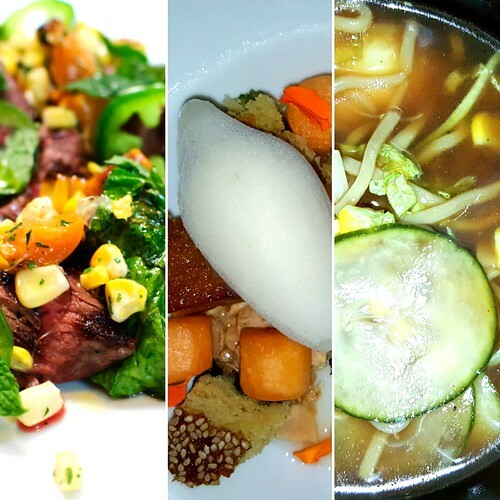 There is a lot of energy and a lot of tasty Japanese fare to go along with the vibe. Reasonably priced with fabulous service, you’ll understand why it’s a favourite while you’re hovering over a bowl of ramen slurping. I recently posted a few writeups referencing ramen. Thinking that I had grown weary of ramen during my university days, it is rather surprising now that I have been hankering for it. Sure, it’s not the blocks that you open and drop in hot water for boiling. I can’t seem to get enough of devouring it nice and piping hot in a large bowl. So, I thought it would be a good idea to have a bowl for old time’s sake, at least to tide me over for a few months as I try to wean myself from this new addiction. While on my hunger quest, I wandered past a Japanese grill and ramen restaurant in Chicago’s Loop. I paused on initial discovery because restaurants in the Loop are for the downtown business crowd: translation — fast food and fast casual so patrons can rush back to the office; authenticity not required. 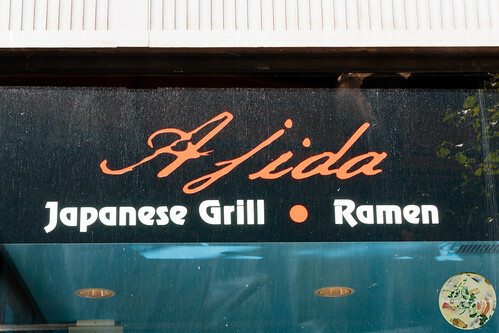 But Ajida at 201 N. Wells Street surprised me, starting with the fact that they’re open on Sundays. 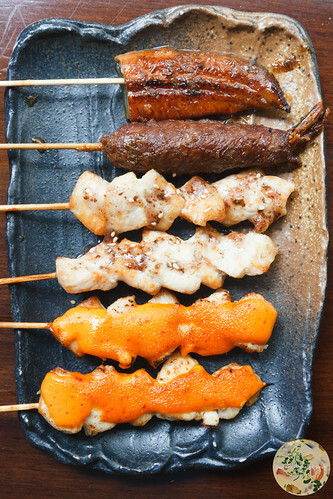 Seeing that there were yakitori options on the menu, I started with four delectable meats on skewers. There were two skewers of wasabi yakitori, consisting of tender chicken breast brushed with a liberal amount of wasabi mayo, enough to clear the sinuses. 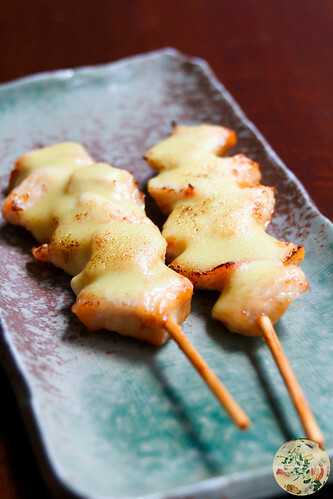 There were umeshisho yakitori, which were chicken breast brushed with sour plum and basil. 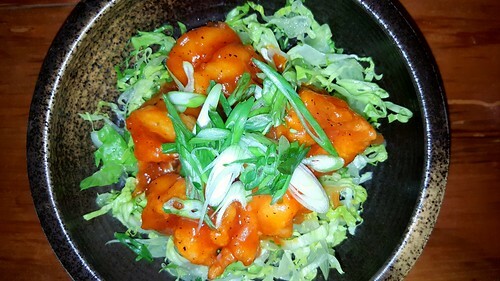 One that I loved from the first bite was mentai yakitori — chicken breast with spicy vegetable sauce. The gyu ebi kushi yaki, thinly sliced beef roiled with shrimp, was simply not enough, it was so blooming satisfying. The unagi kushi yaki meant me having another other of the barbecue eel. And then there was the curry age mono ramen. If anyone wants an example of a Japanese and Thai fusion being done uncompromisingly right, this bowl of ramen is the only example needed. 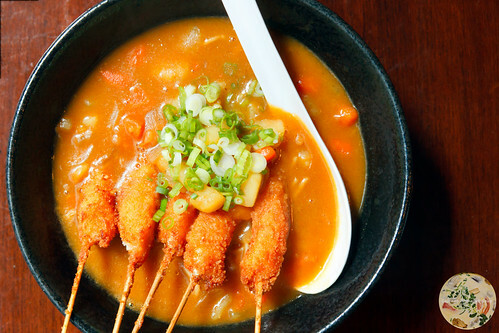 Yakitori of deep-fried, battered shrimp came with the bowl of noodles in a broth topped with curry sauce, pickled red ginger, and scallion. Having recently gone to an Americanized Chinese restaurant that attempted a Thai dish and murdered the curry by cooking the base with an oyster sauce base, I had developed a distaste for Thai curry. Ajida rescued me from my Thai curry despair. 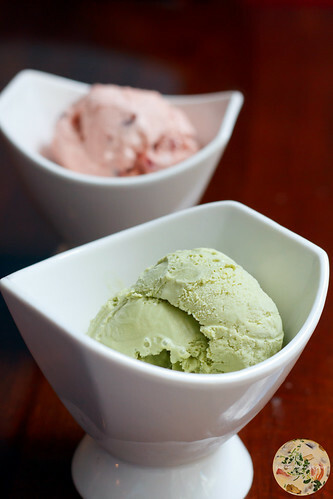 For the finale, I had a scoop of green tea ice cream and a scoop of red bean ice cream. 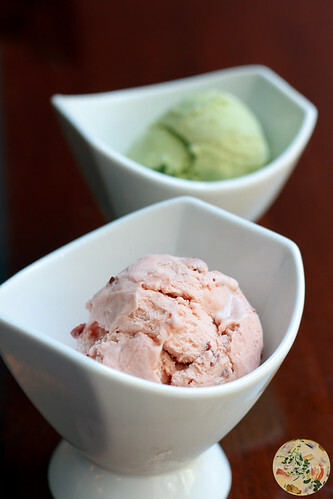 I have yet to find any in the local markets and I’ve been okay with that since I freeze my own ice cream. But when I get ice cream with a wow factor in the flavour the way I got in the ice cream at Ajida, it is simply remarkable and you have to enjoy it slowly. No, it’s not fancy and it’s not spectacular. It’s just damn good. Ajida has been in operation for two years. Much like Ara On, another Asian restaurant I’ve gone to in the Loop, I had passed by without a second glance because downtown restaurants sacrifice quality in flavour for quantity in patrons. The restaurant was empty, given it was a Sunday and I arrived early. The one indicator I paid attention to, that being a slow and stream of Japanese coming through, was all I needed to know that I might want to reconsider slacking up from having ramen; at least from Ajida, I’ll say. Having eaten ramen to the point of disgust during my university days, it has taken me 26 years to entertain the thought of indulging a bowl of it. Having had ramen recently at two other restaurants that have slowly changed my mind, I decided to try Furious Spoon. The location nearest me is at 2410 N. Milwaukee Avenue in Logan Square. The location is fast casual, so there is no table service. And, with there not being an ordering counter in eyeshot, it is mildly confusing at first as to the process of ordering. There are slates of menus on one wall across from the central bar. Not an extensive menu, but you order at the bar and take a seat, after which servers bring your food to you. From a menu boasting vegetarian, beef, pork, and chicken options, I ordered citrus chicken shio ramen. I requested the addition of sweet corn, poached egg, bean sprouts and mushrooms. Arriving at the table in a large bowl, I worked my furious chopsticks on the ramen and then slurped the rest. I would have to dig a hole to China to find something wrong with the ramen. 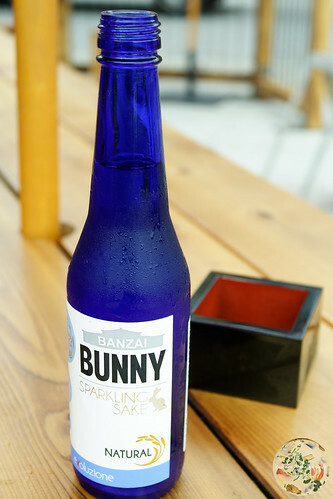 And to wash it all down, I had a bottle of Bunny Sparkling Sake. I need to find out what local markets sell it. Wow!!! Curious as to other offerings, I returned a week later and had a rice bowl. 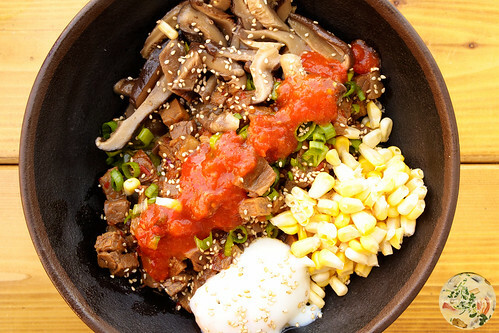 I ordered the furious beef bowl — spicy beef brisket with snow peas, eggplant, and the addition of corn, mushrooms, and a side of fury sauce because there is no such thing as too spicy for me. For all the Korean rice bowls I’ve eaten over the past few years, Furious Spoon takes the win. Again, I employed furious chopsticks on the bowl. Fork, what? And just to pander to my sake addiction, I played it safe and had Bunny Sparkling, although there are other sake and beverage options. 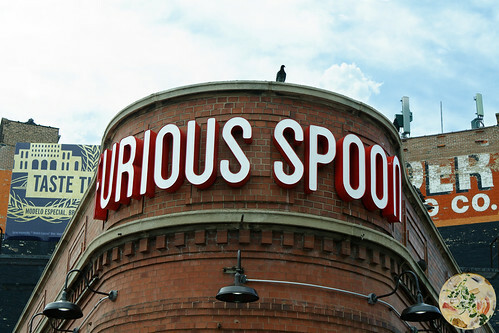 Furious Spoon has seemingly become a popular congregating spot. There is a constant flow of customers, some taking advantage of indoor seating, many taking advantage of the outdoor seating when the weather is nice. For those who may want a quiet to a moderately lively setting, the music on the inside is loud, so there is a bit of a bar ambience. But once you get a bowl in front of you, it won’t matter. You’ll be too busy satisfying your furious craving. While waffling between going to my favourite Italian restaurant or going for sushi, the latter won. 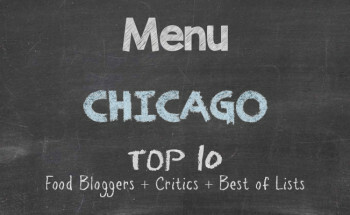 Juno at 2638 N. Lincoln Avenue in Chicago’s Lincoln Park was one restaurant that looked interesting and after reading a few reviews, there was some hesitation. In retrospect, the evening was one well spent. It was good that I went. My restaurant advisor and I arrived for a 6:30 PM reservation. The restaurant was empty until 7:30 when the dinner crowd came. Then it was all high energy. There is the minimalist Japanese style to the restaurant that actually gave me some ideas for remodeling my condo. However, the food was what we were there for. As you will discover, we loved it. The server gave us a visual description of the items on the menu to whet our appetites. Given the menu was only one page, we had no problem narrowing down selections for a 10-course degustation. For our first landing, we had uni shooters. Two vials on ice contained sea urchins, wasabi, tobiko, orange zest, and cucumber. With the sticks that were inserted, we stirred the ingredients and downed the contents in a swallow. Not a filling course, but that was fine. The flavour was simply delightful on the palate with a pleasant aftertaste that we chose not to cleanse with our cranberry juice or sake. The second landing arrived under a dome with captured smoke. After removal of the dome, there were two spoons of hamachi with shiitake and sweet corn. Devoured in whole from the spoons, this was the size of what one would consider a l’amuse. Still, such a small item had an extreme pop in flavour, thanks in part of the cherry wood accented smoke. The third and fourth landings came as a pair. The Juno Queen was spicy scallop with taro and sweet potato on the top with rice in the centre and wrapped in salmon. 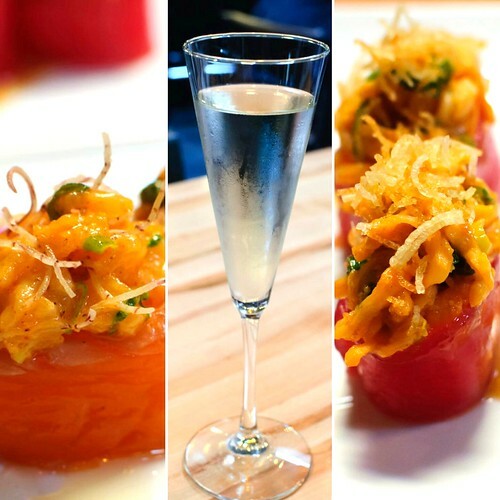 Since the queen will always have a king, there was the Juno King, which was a signature nigiri of spicy king crab wrapped in tuna and topped with crunchy potatoes. Words cannot describe how delectable these nigiri items were. Only facial expressions would be telling. And because the two are better served together for comparison and contrast, if nigiri were a marriage, the Juno Queen and Juno King are perfect models. The fifth landing was the first of the hot menu items that we ordered. This was a plate of grilled octopus with pickled Granny Smith apples, ao nori, and zucchini ribbons atop an eggplant purée. As plain as it looked on the plate, it was anything but bland to the taste. The sixth landing was the server’s personal favourite and quite understandable after the first bite. Tender seared scallop sat atop squid inked fettuccine with shrimp, black bean, and chopped red chili peppers. 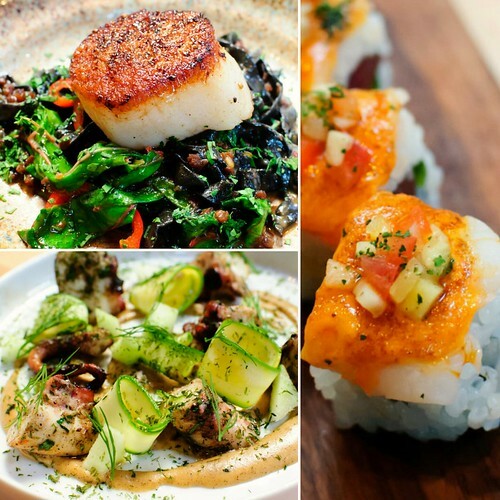 When scallops are done correctly, the flavour profile of the scallops come through with freshness and no muddy flavour. That was certainly the case with this course, and it helped that the fettuccine was an equally scrumptious complement. For the seventh landing, we sampled one of the signature maki rolls, the ceviche. There were whitefish, tuna, and scallions in the middle. On top were shrimp, a hint of spicy aioli, and house made pineapple salsa. With fresh seafood, this was truly Peruvian and Japanese working together in a dish at its finest. The ninth landing we ordered was mushroom ramen. This landing had trumpet mushrooms, roasted corn, napa cabbage, pickles, soft boiled egg, and house made noodles in a savoury broth. Ramen has become quite popular in many Japanese restaurants. At Juno, the mushroom ramen had enough flavour appeal to make it a highly recommended ramen dish to order. For the final landing, we had a dessert of lavender cake topped with sesame seeds, along with cantaloupe, lychee sorbet, and candied almonds. There was also a delectable citrus sauce poured in the bowl that took the dessert to a new level in bliss. Certainly not a heavy dish, but the flavours of all of the ingredients played well without any overpowering or competition on the palate. It was simply heaven. 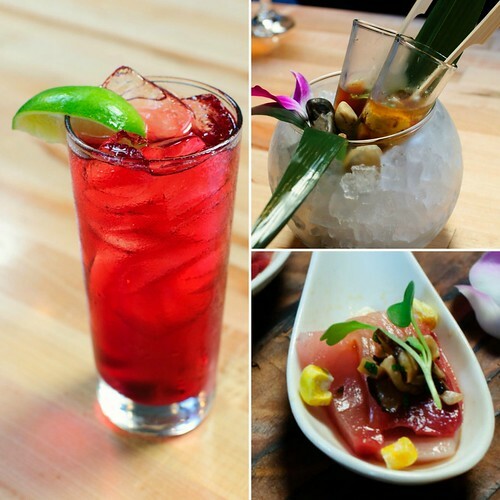 Juno does exceptionally well with small plates, keeping in the tradition of serving dishes like in Japan. There is a bit of a high price per item, negligible for those who appreciate fine dining. Those who are accustomed to the “Chicago way,” that being restaurants giving so much food that you have to take some home, may find the cost problematic given the size of the dishes. For us, quality trumped quantity. And the service is simply outstanding. 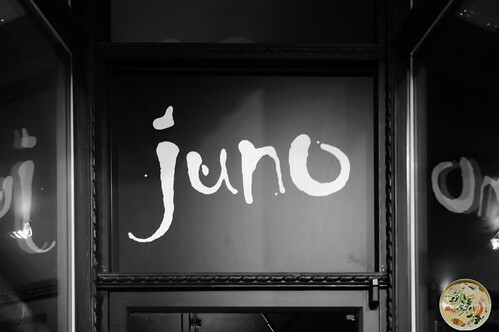 Overall, Juno was an enjoyable dining experience on three sticking points that we use to rate restaurants: quality of food, service, and price.